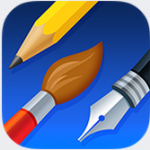 Drawing Tools & Apps. These are the tools I use to create my drawings. You can do the same drawings on a iMac desktop but, for me, it feels more like drawing when I use my Apple iPad.